Colors are bright, black's nuances gorgeous, the engraving is very fine. The aspect is silky, on a thick paper. Original, not a copy. 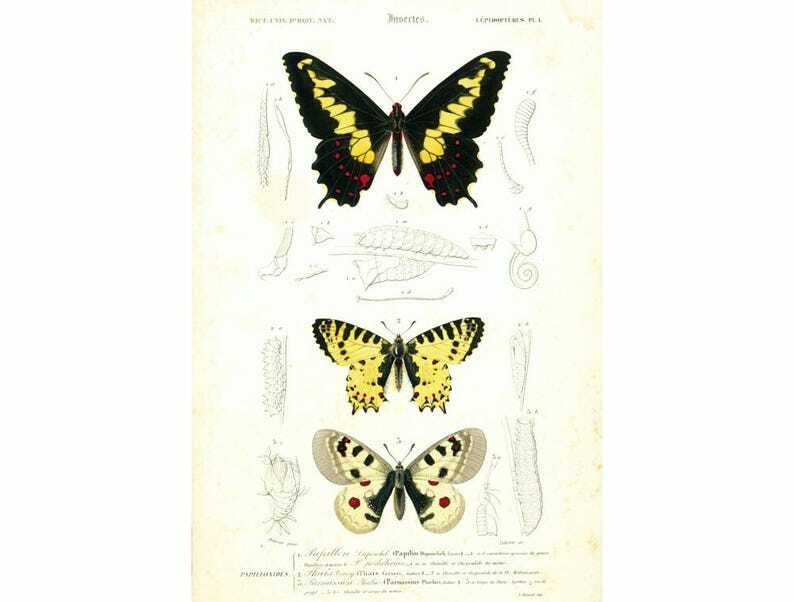 This print is taken from the Dictionnaire Universel d'Histoire Naturelle, a publication directed by the french naturalist Charles Henry Dessalines d'Orbigny. This is the 1861 edition, with some 288 prints are assembled in three atlases. The engravings are hand-painted and varnished. The colours are brilliant, the drawing very fine, and te relief are very well rendered. Volume I : Zoology - Humans, Mammals, Paleontology and Birds. "With its 13 (subsequently 14) volumes of text and 3 volumes of prints, the Dictionnaire Universel d'Histoire Naturelle is one the great scientific works of the 19th century, and made the natural world accessible to an educated audience. The prints in the Dictionnaire d'Orbigny are among the best produced in this field during the 19th century, strikingly realistic thanks to their great precision and detail, and the beauty of the lines and colours. The apogee of scientific drawing." (Eric Baratay, Un théâtre des bêtes : les planches du Dictonnaire Universel d'Histoire Naturelle). Good condition. Red. The colours are very sharp. Envoi rapide et très soigné. L'article est parfait, très beau, et correspond à mes attentes. Merci beaucoup! I am so pleased with my print! It is completely true to the image in the listing, and it was prepared for international shipping very carefully. It arrived safe and sound and in stellar condition. 1960 Vintage Dragonfly Print. Nymph. Odonata Illustration. Insect. Entomology. Natural History. We accept payment via Paypal, credit cards, debit cards and Etsy gifts cards. Returns are accepted within 14 days after receipt. You have to ask before sending. Shipping fees round trip are refunded when the responsability of the seller is demonstrated. The purchase is totally refunded when the buyer choose the option Insurance with Confirmation of Delivery. The possible replacement of the items will be individually studied. Our shipping fees include the extra cost of the tracking. The insurance with the confirmation of delivery is optional. Goods are shipped at the purchaser’s responsibility. To cover the risks of loss, theft or damage - subject to a special rate - please contact us. In case of automatic return of an unclaimed parcel, and if goods are in their original condition - the item value will be refunded. Please ensure the delivery address you have provided is complete and accurate, and if possible supply a contact phone number, as this can be useful for the postal service. We send Priority Letters and Parcels all around the world, 1 or 2 business days after the order, via the french postal service (La Poste). All our shipments are with tracking number. The items are carefully packed ; the prints into sealed cellophane and flat rigid cardboard enveloppes, the curios in bubblewrap and strong cardboard boxes. When your order is dispatched, we will send you a confirmation email along with all of the relevant details (tracking number, estimated date of delivery where provided by the postal service, and any other useful information). These usual delivery times are not guaranteed. The international import duties and taxes are not included in the shipping fees. They are the responsability of the purchaser and will be asked by the customs service of your country.